The WOA Champs at Queens Birthday this year will see a good portion of the New Zealand JWOC team competing. Queens Birthday is the last big race most of the team will experience before they head off to Europe. With only 7 weeks until JWOC commences, it will give us a good indication of how the team’s preparation has gone and how they are likely to perform at JWOC. Everyone has been putting in good training hours and these should translate to great results at JWOC. Apart from the long were Cameron Tier and Callum Herries are running M20A, four of the team will be battling it out in M21E along with the seniors. 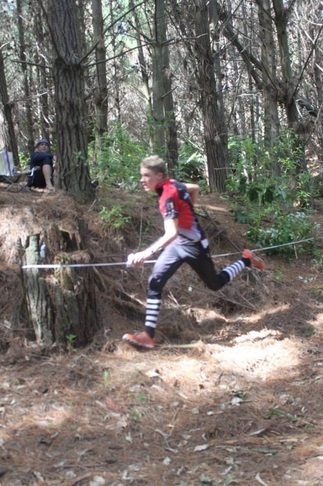 Tim Robertson, Shamus Morrison, Cam and Callum are all fast runners and should suit the very quick terrain of Fusilier and Waitarere. With 6 minute breaks in the long, the start interval is pretty huge, but if some of the team does end up running together, it is likely to be at a furious pace. Tim and Shamus have been smashing out the evening sprint training in Wellington too, so watch out for them tearing around those building corners in the sprint. In the women, Alice Tilley and Kayla Fairbairn should put on a fierce battle as usual in W21E. Both have the potential to do extremely well in any of the races this weekend, so look out for them on the top of the podium. Becky Gray will also be there in the sprint to shake the field up, and is running W20 for the other two days. The sprint around the new revised map of the complex Massey University campus is likely to be technically challenging with both tight navigation but also difficult route-choice decisions. Throw a couple of hills into the mix and the strong, clean runners should emerge on top. 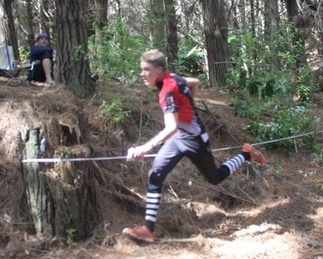 Pine forest sand dune for the other two races should ensure offensive orienteering where flow is going to be essential. Fusilier is blindingly fast but also deceptively vague so expect mistakes with direction if you feel your concentration slipping. A good exit direction is like breakfast, it sets you up for the day and without it you make mistakes and underperform. The middle map features the extremely technical coastal block of Waitarere Forest, full of confusing details and thick vegetation. To be in the fight for the medals here you need aggression through the terrain but a good plan and care with the map reading. With lack of respect for the difficulty of the area the forest god will chew you up and spit you out, lost and confused in the dunes. On top of this, you will need Usain Bolt’s legs for the rest of the course through the inland blocks of Osgiliath. Unfortunately I will not be racing as I sprained my Achilles tendon 11 days ago and it has not healed enough to run yet. At the moment it is lots of foam rolling and deep water running that is getting me by, but the recovery is going well and I expect to start running next week. With the way the team’s been training, the racing this weekend is likely to be exciting and exhilarating. So much so that you may even have difficulty concentrating on your own run when you see the Moose loping through the forest in front of you.